Cal alumna Joyce Nao Takahashi (55) was born in Berkeley, California, the second daughter of alumni, Henry (26) and Barbara (30) Takahashi. She grew up in Berkeley, with the exception of the war years, which she spent in Tanforan, California, Topaz, Utah and Chicago, Illinois. She graduated from Berkeley High School, and the University of California, Berkeley and received a Ph. D. in Chemistry from the University of California, Los Angeles. In retirement, she is an Emerita Adjunct Professor of Chemistry, University of California, Davis, California, and a volunteer with the Time of Remembrance program at the California Museum, Sacramento, California. 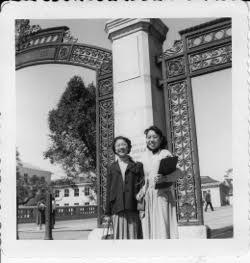 As a board member of the Japanese American Women Alumnae of the University of California, Berkeley she participated in the clubs oral history project, which is the basis for the monograph, Japanese American Alumnae of the University of California, Berkeley: Lives and Legacy.